I’ll start of by saying no I didn't meet them, but i got as close as any normal fan can about get. Before the story begins, let’s take a look at the Oxfordshire band. The band consists of four Oxford friends who have been together since school, this quirk pop-quartet are fans of Flying Lotus, Burial and Animal Collective and took to the forests creating their own fortress of solitude titled ‘the shed’ a safe haven for the band to experiment and cultivate their music into success. When asked to label themselves in three words they chose “Occult Bunny Lagoon” it’s those three words that perfectly describe the band. They are eccentric, their left-field lyricism and oblique lyrics not only coined the popular phrase “Peanut Butter Vibes” but has entranced audiences, their obscurity and immersive sound encapsulates their audience and transports them to their own interpretation of the experience, there is no one transfixed meaning in the music, it is there to be enjoyed and not decoded. Things have been moving pretty fast for the school mates from Oxfordshire. In 2014 Glass Animals, to much critical acclaim, released 'ZABA' their debut album which is looking to be only the beginning of what threatens to be a band that’s about to blow up. Promoting the album has seen the band travel across the pond playing the states and doing the rounds gathering a strong following internationally which, in theory, promises us a summer where they dominate the festival circuit and will hopefully justify the rapid ascension of success they seem to have found. 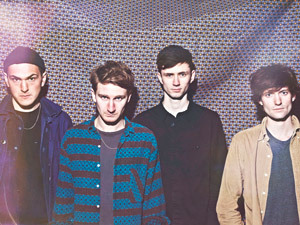 As far as Indie bands go, the ‘Gooey’ performers Glass Animals come from the strand of Alt-J rather than your Britpop era bands. However, they are not merely imitators taking the experimental Psychedelic sounds and just putting a spin on it, they've transported the sound to entirely new depths utilising singer Dave Bayley’s crooning falsetto over an amalgamation of immersive psychedelic jungle sounds (which is a theme throughout ZABA) and quirky pop that manages to even take influence from Alternative R&B. With the band in high demand both here and the states (with a Letterman appearance under their belt) it is no surprise tickets are snapped up in a heartbeat, it was only due to a chance encounter at university that gave me the opportunity that any fan would dream of. I happened to make friends with a soul and funk producer and DJ titled Sol (Alex Bagenal as I refer to him normally) who by coincidence is drummer Joe Seawards friend and neighbour. Taking advantage of that fact meant I was able to score a pair of tickets to their ‘Shepherds Bush Empire 02’ show back in March, as a fan it was imperative to keep impartial but I have to admit I was excited. As the curtain rolled back I was transported to what I would call the aesthetics of ZABA with giant palm trees in pots, foliage around the stage and a huge patterned back drop with their name across it as if anyone at the sold out show needed reminding who they were. As the band took to the stage you could feel the anticipation and excitement grow amongst the crowd. Jumping straight into ‘Black Mambo’ an early track from their self-titled EP, a crowd favourite with a chance for Dave Bayley to show off his falsetto to the crowd which is complimented by the strings and drums. It looks to be up from here as they transition into popular single ‘Gooey’ which gathers huge support from the crowd with them echoing the lyrics almost word for word. As they move through the set playing another popular choice ‘Hazy’ and then album tracks ‘Toes’ and ‘Flip’ It becomes apparent that the band is being let down by poor sound quality with the bass echoing threatening to become borderline annoying and starts to disengage audience members further back towards the bar. However the masses of people dancing frantically close to the stage show no sign of being bothered by the sound. As Bayley stands tall atop Joe’s kick drum he announces his stage presence and shows us the confidence that he has bloomed from his early days of nervously hiding under a blanket to record music into a unrestricted, dancing, energetic performer. As the encore begins the audience is wild and a Kanye cover of ‘Love Lockdown’ accompanied by Dave’s rush into the centre of the crowd sends the audience into what can be best described as a scene from Lord of the Flies, a frenzy of wild limbs and blinding lights and sweat. As they close the show with crowd pleaser ‘Pools’ Bayley throws a pineapple that was part of the set into the crowd to be fought over like it was a sacred relic. As the audience exits I notice the man holding high the pineapple chanting and smiling and it is that image that will iconise the full night and an image that will stay with me. 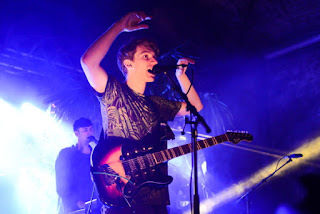 That image proves to me that if a band can create a moment of pure joy and ecstasy to one person then surely they can do it on a larger scale and that is why I believe that this summer as the Glass Animals drag themselves onto the stage of festivals (Leeds & Reading to name just one) they will be able to prove they can encapsulate and mesmerise an audience and wow everyone with their ‘Peanut Butter Vibes’. After the show I was able to go backstage at the 02 surrounded by friends and family of the band. However thanks to the TFL inability to make tubes a twenty four hour service I had to cut my time at the backstage bar short. However, not before meeting Labyrinth of ‘Earthquake fame’ and finding out that the reason I missed my chance to greet the Oxford boys was because they were sipping champagne with some execs, obviously enjoying the fruits of their labour and some well deserved downtime after yet another busy night. Overall my experience was one of complete wonder and proved to me they can handle their success and proves that it’s only on the up from here. They're in for a big summer and I say good luck and see you in the performance space you belong.